Mazda 323 GTR pilot Timothy Auty has dominated the Kennedy’s Welding Supplies Southern Safari to claim an emphatic triumph in the CAMS Tasmanian Rally Championship. Driving alongside Jon Mitchell, Auty won all 10 stages to record a victory of almost five minutes ahead of Peter Nunn and Keith Johnstone in a Subaru Impreza. However, the battle only came about in the fifth stage when Keith Abblitt and Nicole Bryan were forced to an early exit after completing just the first four stages. The opening three stages saw the Mitsubishi pilots piling a heap of pressure on Auty, finishing less than four seconds behind the leader on the first and third stages. In the fourth stage, they faced issues and finished more than half a minute behind the leaders, but still managed to squeeze into third by the end of the stage. Unfortunately they were no longer able to continue the event, leaving Nunn and Johnstone as the closest competitors to the leading Mazda, but the gap was already too large and Audi and Mitchell comfortably continued their charge to victory. Taking out the final step of the podium was another Subaru pilot in Danny Traverso who was driving alongside CAMS Australian Rally Championship co-driver Steve Glenney. Pete Nunn was second in his Subaru Impreza WRX. The pair had an extremely slow start to the event, finishing out of the top five in the opening four stages, Abblitt’s premature exit seemed to have a positive effect on the pair as they powered their way up the field to finish third outright. Rounding out the top five were another two Impreza pilots with Troy Johnson and Aaron Saunders finishing above Ralph and Alex Norton. It was a difficult day for a few of the drivers with Abblitt not the only other big name to not finish the rally, with the number four seeds Aidan Peterson and Elliot Ritchie falling at the seventh stage. Behind the wheel of the Holden Commodore, Benjamin and Rebecca Sheldrick were forced to retire on the following stage when they just managed to limp their way to the end of the eighth stage. The number five seeding in Andrew Morrish and Damian Grimwood started the event but were unable to finish the fourth stage. The Mazda RX7 duo found their way back in the event for the fifth stage but by then it was already over and they were unable to record an official time. 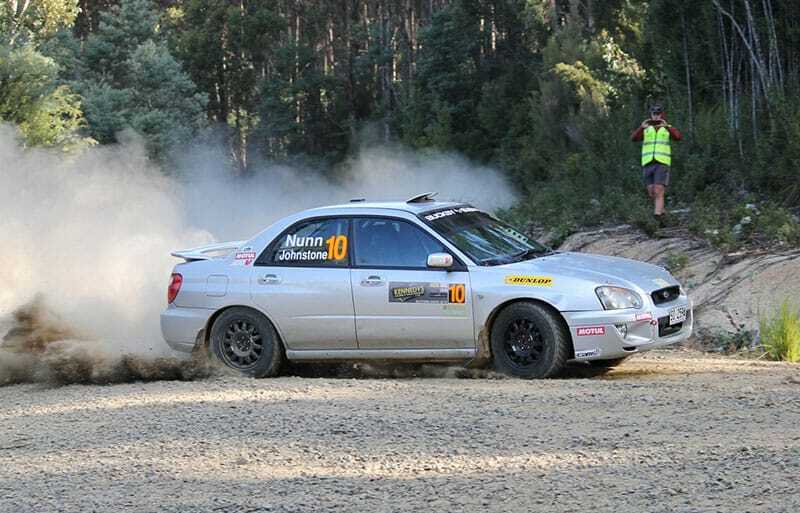 The next round of the CAMS Tasmanian Rally Championship is the The Hellyer Rally on 18 May. View more photos from the Southern Safari HERE.